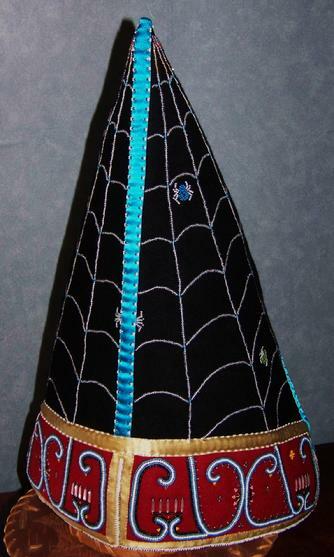 I was inspired to make this Mi’kmaq style peaked cap to honor Clarissa Basque Tellier, a Mi’kmaq woman and great grandmother of artist and author, Gerry Biron. 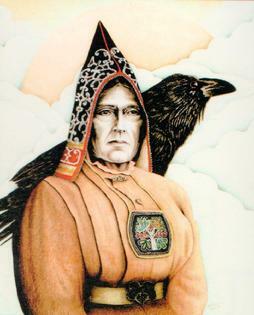 In a portrait that Gerry did of Clarissa she is wearing a beautiful Mi’kmaq peaked cap. I wanted not just to recreate this old style peaked cap, but to also include a contemporary design to honor the woman that Clarissa was. 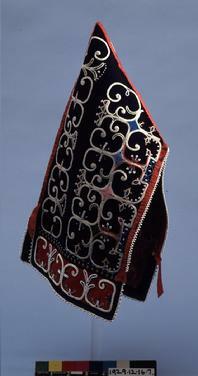 The beadwork design on the upper portion of this peaked cap follows a design found on a Mi’kmaq peaked cap held by the British Museum. 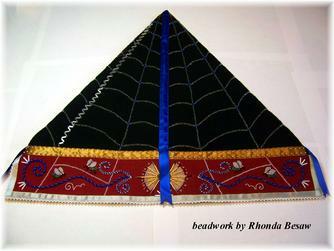 The bottom panel is my original design which represents the medicine plant, juniper. Small white birds carry the remembrance of Clarissa and all our Grandmothers. 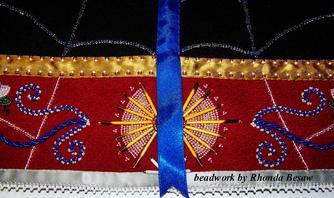 My work is signed in beadwork, the mark of a squirrel. 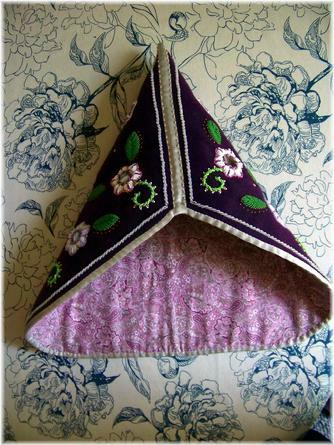 This peaked cap is made of wool, glass seed beads, antique steel cut and brass beads, silk ribbon, cotton lining. 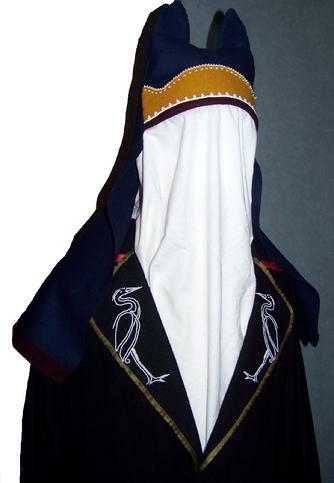 Abenaki Style Peaked Cap/Hood incorporating raised beadwork......seldom seen today, these beaded peaked caps or hoods were popular among the Wabanaki People in the 1800's. This peaked cap is my design. 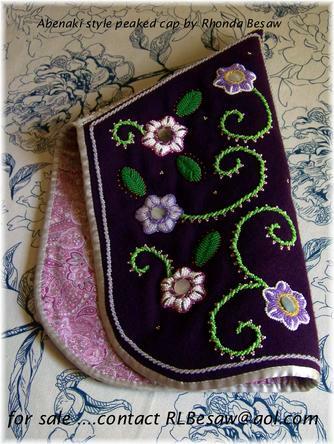 Dark purple wool lined with cotton fabric. 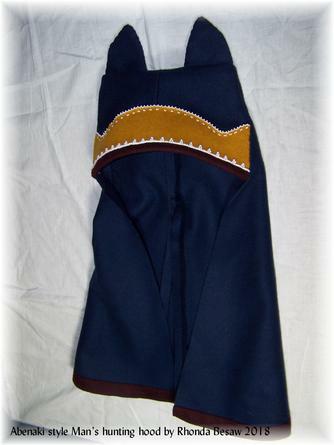 100% silk ribbon trim. Glass seed beads and abalone shell centers in every flower. 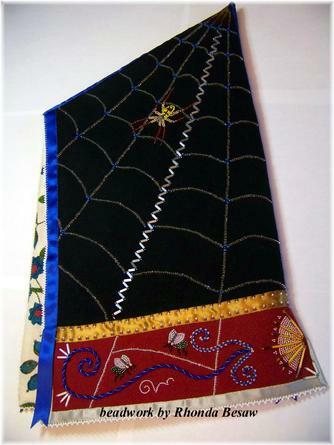 Completed in 2014, this Mi'kmaq style peaked cap is made from wool, seed beads, bugle beads, antique steel cut beads and other antique beads, silk ribbon, vintage lace, cotton fabric. 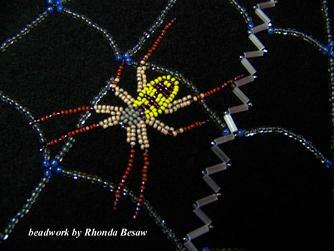 My original "spiderweb" beadwork design is on the top portion of the peaked cap. 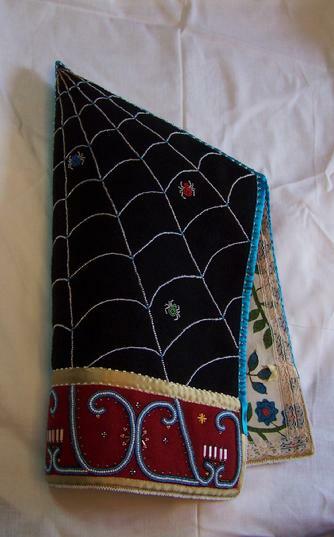 It includes 7 Spiders, each honoring the 7 directions. 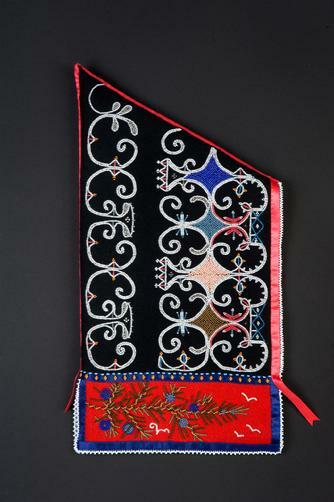 The bottom red wool panel incorporates traditional Mi'kmaq double curve designs. 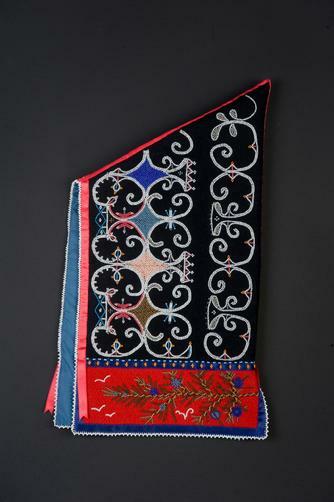 but a mix of contemporary beadwork designs and traditional designs.